The best SEO wordpress theme- Thesis. Top 6 Reasons Why I choose Thesis as the best premium SEO wordpress theme. I love Thesis! This word explains what this post’s content about. Yes, I finally got Thesis a few days ago, and i am really new to it, but i already love it. Why do i choose Thesis theme as the best SEO WordPress theme? Because Thesis is just cool. Not only Search Engine Optimized, it is extremely easy to customise if you are non-techie person. Popular people use Thesis theme. Matt cutts Head of the Google Webspam Team, Dave Navarro Jane’s addiction guitarist, and many more. Here are the advantages if you use Thesis, Best Seo WordPress Theme! 1.Built in All In Seo plugin. With Thesis, you do not need to use All In SEO plugin (AIO) because it has built in SEO settings. I have worked with a client’s blog which uses other SEO premium theme, and it doesn’t have SEO function like Thesis. 2. 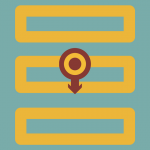 Favicon automatically for your wordpress blog. Right, Thesis has favicon uploader. Once you are sure about your favicon, click upload button, and bam! you have your favicon set up without being dizzy to add a code. 3. 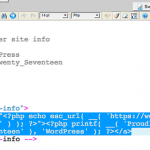 WordPress Header image uploader. 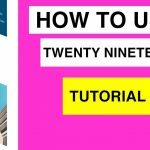 Don’t be confused how to upload your header image, like Twenty Ten, Thesis enables you easily to put your custom header of your wordpress blog. 4. A lots of Custom color layouts for your theme. I have lots of changing color tutorials of your template by adding codes, with this best SEO WordPress theme, you can change color just by a single click of your mouse. 5. Get a theme where you can change having one sidebar, two sidebars or three sidebars without adding any confusing code to a file. 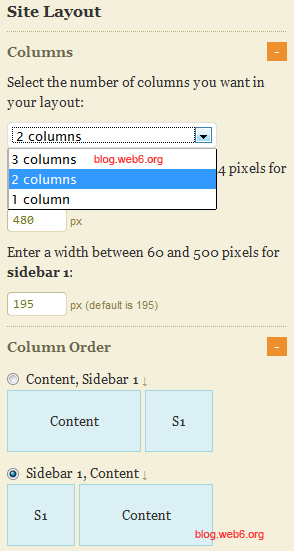 Just click some option button, and get your own column theme. Complete with right or left sidebar options including the width! 1/2/3 Sidebars or Colums → Left/Right sidebar options. 6. It is validated in W3C. Because i love blogging and wordpress, i have visited lots of blog, which use premium themes as well, and they are not validated, but Thesis is. One of the reason why Thesis is the best SEO WordPress theme. 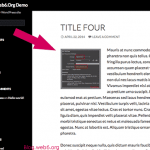 web6 uses Thesis, and w3c validated. Get and download Thesis 1.8 now before the version 2 out, the price will be 297$!! See image below, If you don’t like it,you have 30 days money back guarantee! If you have difficulties for a refund, feel free to contact me. 1. Even you can download it from an illegal link, Thesis is always updated and new version will come often. Will you want to search illegal links everytime new version comes out? I guess not. 2. Your blog can be sued/suspended by your host if diythemes.com team or someone else contact the webhost where you have your blog, because you use someone’s product illegally. 3. Other than that, do not be surprised if one day or even the next days after you upload this nulled theme to your server, your blog will be hacked. Why? because in nulled or cracked themes, you would not know what malicious code a person can encrypt to these files. If you pay about 87$ for a lifetime updates, and you can soon get your money back when your blog has a good position in Search Engine by monetizing your blog, why would you put your blog in risk? None would. Get the best SEO WordPress theme. Looks really good to me, but I have a Q. I’m new to WP and really like the Weaver 2010 theme, because it also can be customised. As this theme is free, what is the main difference of using a Thesis theme which is paid, over Weaver 2010? Oh alot of differences, i should add in my post later. Except of we don’t need all in seo plugin, and other feature lists above, with Thesis, we can embed youtube without using plugin, and it will show in sidebar (only for any posts you like this video to display), robots meta options, example you don’t want a post or two to appear in Google, redirect page without plugin, example you want to include your other website in your navigation, just create a page, and put your other site’s URL on the redirection option. Adding Google analytics code can be done without editing your theme code, copy and paste the code in Thesis option box. 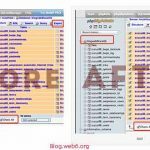 It can be a pain if you have to edit hundreds of your post SEO settings, this is why i recommend it if we start our blog and plan changing theme. Thanks god i have about 10 posts in web6. different person has different ideas to Thesis, no matter what,you can with you own view! Premium theme have good coding.And SEO optimized .Free theme contain some Looping codes inside theme.Premium template create uniqueness .And make your blog more Professional . Unfortunately i don’t do link exchange at the moment, but Thank you very much for the offer. Yes, Thesis is the Best SEO wordpress theme…and also i using this theme on my blog. I regret why i didn’t buy this theme sooner. As i always thought, that before my blog can earn me money, i would not buy any premium theme or plugin. But with Thesis, it is really worthy. 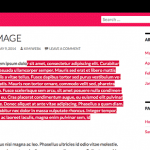 You won’t regret it, even Matt Cutts from Google uses Thesis for his blog’s theme. i too like thesis but the worst part part is custimization to make it unique…. It depends on how far you want to customize it i guess. I like to keep Thesis clean, and not too much customization. If just changing color, background, etc, then it is already in design option. Thesis is already established. Each day more and more blogs are thesisized. After reading lots of tempting reviews, I wish if I had one. I’m using TwentyTen Weaver currently and there is no reason I hate it yet. So am in a big dillema, should I spend another dollar in my pocket! Thanks for listing features with screenshots. We got to peep inside thruogh. I know how it feels, i felt exactly the same before i use Thesis. Well this is my opinion: If you don’t earn money from your blog, i would go with free theme, they are fine. Thing is, if you plan to change your theme to Thesis one day, you will have to edit post one by one because of its SEO settings. Plus, there is no difference to get it now or a few months later, you want and will buy it anyways. I also didn’t buy Thesis from money from my pocket, but from monetizing this blog. Unless you have a business blog, of course you want to impress your readers with a cleaner design, and more professional, instead of “usual theme” that people see in many blogs. I agree, Thesis is the best one! I am already using Thesis theme and I just love the way it works. It’s just amazing and recommended for all. there are tons of premium themes out there, Thesis is still the best of them all. Thanks for leaving comment Sahil. Kimi you have a great post here about Thesis which I avidly support. However the proof of pricing image you display is a fake link. That is a google sponsored advertising result, paid to display at the top and if you take the URL it shows and try to go there it will not work. No one knows for sure what the cost of 2.0 will be but Chris Pearson has hinted at the $297 number so thats caused a lot of speculation. With the economy as it is though, and several other themes having come down in price, that tag will be a very hard sell so I’m uncertain it will actually go there. Thanks for a great post and for stopping by my blog! Thank you for coming too! In the point 4, it states that when the new version hits the market, the price will be increased. You’re absolutely right, I guess it will be hard to sell, i mean people will think ten times to spend about 297$ to buy a theme, but Chris apparently has confidence about it. The page may have pulled an old image first time I refreshed it because the screenshot was showing diythemes.com/thesis_2.0 which is the page an advertiser has been using for sponsored ad that does not direct anywhere. If I search for “thesis 2.0” the adwords ad that displays of course “goes” to the right place, but the where its from text below it shows diythemes.com/2.0 which again is not a real page. I totally agree that price is going up – I just know that we have not had a final word on what the price will be and I also know that our contracts with shareasale for thesis affiliate have strict rules on us making claims even though Chris of course has no self-restriction on his own advertising LOL. $297 is going to be a hard sell with Genesis fast on Thesis tail. I love Thesis but I’m keeping a close eye on what Genesis is doing both in design flexibility tools (uploaders etc) and in seo components. At this point they are the “competition to watch”. Thanks Kimi its great to connect with you. Please to meet another Thesis junkie hehe! 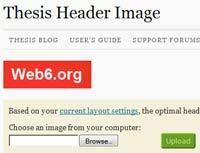 I have a client that uses Genesis theme, i personally will choose Thesis. Thesis has more features/options in dashboard than Genesis. It is great to meet you too! saw your link from seommotips. Thanks Kimberly! PS: Which comment reply notification are you using? Is that Ugh’s? Looks slightly different than the one I use but has no footer that tells which one it is. Does it work from the dashboard or only the front end? Thanks chica! The ReplyMe setting is from dashboard. Can’t agree with you more. Made the right choice by using Thesis. Aside form all the reasons you have mentioned above, I think that the support (forums and bloggers) is one of the main reasons why I chose to use Thesis too. Totally recommended. Yes, i agree, i have visited the support right away after i got Thesis, and it is indeed helpful. thesis is a cool theme! Buyers wont regret using it! Thanks for sharing. Have fun. Absolutely agree, thank you for visiting and commenting Samuel! What about Frugal Theme? I think Frugal is best seo wordpress theme. But Thesis is the best, since most bloggers use it, and Google staff too. Great share Kim, i agree that Thesis is the best SEO Theme bec i am using for my site since 1 month , the response is awesome than my first blog i started through Blogger. Awesome kbharath! Glad to meet another Thesis user. 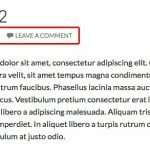 Good luck with your new blog, and thanks for commenting. Thanks for the rundown. Thesis certainly has a lot of features that I haven’t realized. Personally, I use the hybrid theme, which is probably a close second to thesis in terms of seo, but doesn’t have some of the other stuff like uploading YouTube movies without a plugin. I will say it’s definitely important to have a quality seo optimized theme. When I first started my theme wasn’t optimized at all and my blog didn’t get indexed for the first month I was running it. After changing themes, I was fully indexed within a couple of days. Now my new posts are indexed within a few hours. From everything I hear, thesis would be just as efficient seo wise. I agree with you, Hybrid is also a great theme, but is it updated as well? I don’t know about it. Hybrid was listed as free seo theme a few years ago, but haven’t heard about it for a while. Again, theme alone won’t work without quality content. Hybrid is updated. It’s still free. The author provides basic support for free, but they have a subscription model for advanced support. It’s like $25 a year. I don’t have the subscription. The theme is easy enough to use without the advanced support. Great Richard! Thanks for the info. Just didn’t heard about Hybrid for a while. 297$!! Is not it little bit expensive? It is expensive, this is why if we want to buy Thesis someday, it’s best to buy now, when the price is still “reachable”. If I buy thesis I think I’m going to go with the Developer’s Option in case I create another blog/website. Quick question though, do you think an upgrade to the Developer’s option in the future will be available or they might take that out? I wanted to try the Personal Option first before paying a full amount for the Developer. I guess it will be still available. Most people want to try the personal option first, i guess it can be a good reason for that. You will also be able to get 30 days money guarantee, in case you don’t like it. But i am sure you will! Its good to see that you have started to promote Thesis. But it would be real good if you change your theme to Thesis, bcoz most of the readers wants proof. I hope you understand what I am telling. 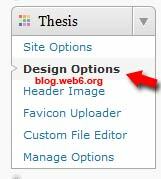 Of course i use Thesis, but in my web6.org (personal blog). Thanks so much for the great input and coming! I love thesis but for a newbie I think Woo Woo is perfect.Most of the elements in woo themes can be customized with out any coding experience. I love Thesis and to keep it simple. The best part is because it is SEO optimized. To me, design will follow, first have to be SEO optimized. what can I say.. you’ve written some of the great things about Thesis already. Im using it on my blog if you’ve noticed 🙂 But sadly I feel like Im not maximizing its full potential. If only I was a better coder. Yes, i have noticed you use Thesis theme. Thesis is a great WordPress theme for SEO, I have used it on several of clients blogs and they love how easy it is to use! Thesis is very powerful theme for WordPress, this is why it is the most famous premium theme. Thanks for visiting my blog Chris. I agree, Thesis is a top wordpress theme for SEO at the moment. Yes, I love Thesis! I was going to run my blog using a free theme but after weeks of watching and researching Thesis, I finally decided and bought the theme. I’m a satisfied customer for sure. It makes it so much easier on someone like me because I don’t need to do that much coding. I would definitely recommend it to anyone who was a blog. I also strongly recommend that when people plan to change their themes, it’s best to do it from the beginning from starting a blog. I had this experience before, i changed my theme, and it was a hassle, i have to put back google analytics code, search engine verifications, etc. Plus i have heard it effects Page Rank too. This is my first visit to your blog and you are doing great job here. It is like a ebook for wordpress learners. Looking for more good stuffs here. Thank you kimi. Thanks for the nice words Thiru! I am not using Thesis. Will not be using it at future too. Because, I already ‘ve made my free theme as like as Thesis. iNove is a great free theme. It is great that you can make a theme like Thesis. Nice Theme and Great Post. I agree with your points. My favorite feature is the media box. I recently discovered you can specify an image for that spot for each post. There are so many options you can get dizzy finding them in the Thesis dashboard! The custom css styling file is very useful for playing with customization not available in options. I find some owners have a mental block when it comes to choicing options or the mention of CSS so they miss out and end up with the vanilla version of the theme. I agree there are tons of options you can modify easily, the most important is the SEO options in the site options. Everyone wants to have their own modifying theme, as you said, and some people want to keep them clean and simple. Thanks for your time leaving a comment, have a nice week ahead. I hope that tip helps. Yes, you can still use AIO, but it is optional, and i have tried Keyword density checker a few days ago, i have deactivated it. Because my dashboard runs slower than usual, and it is fine to me to go to Adwords Keyword Tool checking the keywords. Hope to see some exciting features in up coming versions of Thesis. Chris is updating his theme, Thesis very often, even version 2.0 is on the way! Thesis is having some outstanding functions but I love Genesis more because of its outstanding child themes. Yes, i also recommend Genesis after Thesis. Thesis is still more popular than Genesis, but Genesis is cheaper. I have worked with Client’s site who is using genesis, and i still notice than Thesis has more features. Genesis has lots of child themes, and Thesis has alot of free skins available too. Thesis is good because it allow you to design child theme and also support for a good & quality framework. Hey Dan, Thanks for leaving a comment. I am very anti-Thesis! It is not a very great theme for bloggers who are weak at coding. It is the opposite, Thesis gives lots of options to make WordPress bloggers who are weak at coding easier to modify the layout and color. There are lots of free Skin too for Thesis users. No, I have not used Thesis. But a few of my friends did purchase them and really struggled to get the kind of look they wanted. Eventually they had to pay quite a sum to customize their Thesis theme. Which is why I hesitate purchasing Thesis. It depends on what kind of modification you want to apply. Every themes needs money if you want to modify accordingly to your taste. Not only Thesis. As to me, i want my thesis to be clean. See web6.org I didn’t pay any cents to anyone. I know how you felt about hesitating to purchase, i had that too, but after i bought it, i love it! Thanks for sharing your thoughts Vivek! I use thesis since it gives many options to work with on my theme. I can nofollow any particular link and use proper site architecture. However I don’t believe W3c validation has a big effect on SEO. I agree with you, with Thesis you can control any links with dofollow and nofollow links, by default it is already optimised, so those links which should be nofollow, are already set to nofollow. 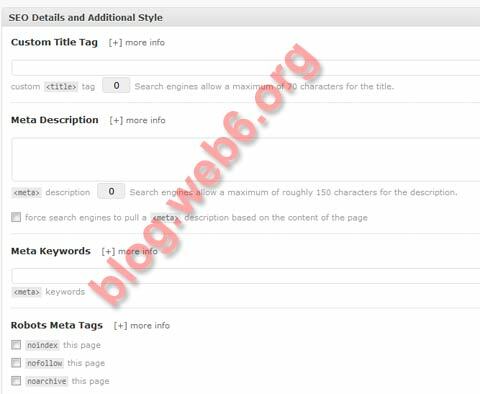 Considering WordPress has tags, categories, and they will land on a same page. I agree about if you can customize a theme, then you can customize anything as you like, but it is not like Thesis, probably the look will, but not the features or the SEO optimized part. Atahualpa is one of the most free popular theme, but when i visited a site, i would knew what the site is using because they look similar. Thanks Kimi , but dont you think Thesis has now become sooo common ? Well your blog has distinct look of thesis so thats different story , but when i check other thesis powered blogs , almost all of them has the same ditto look ! May it be the color, navigation and same widgets all over 😛 Now even thesis duplicates are freely available on the net . I love thesis in various shades and touch but it becomes unbearable to see almost all blogs having ditto cloned thesis look alike . Terrible that they just copy each other’s look and dont care to tweak it to make their unique identity . I partly agree with you Ajinkya. But the powerful about Thesis is the “SEO optimize” part. Free duplicated Thesis is illegal and shameful. I hate when people can’t respect someone’s hard work. But then duplicated doesn’t mean it has the same functions, especially the SEO factor. Perhaps you are right, but Thesis is the most popular theme. I will search for ontheme, as i have never heard it, Thanks! My first visit to your site. I had to look around and I liked what I saw. I can feel you are earning an income with your blog which is awesome. Your blog post is cool about thesis. It is good and I know many people who are using it. Thank you for visiting my blog and leaving a nice comment. I have also recommended after you can monetize your blog. But if you are good at selling you will get your money back after a few weeks promoting Thesis via affiliate. I have been using Thesis theme for almost an year..Or probably more than that…..
One reason is its SEO capabilities and another reason is because of it’s flexibility to customize..!!! I so agree with you Harsh, thanks for visiting. I also think Thesis is the best seo wordpress theme. Thanks for your sharing us really clear step by step. Hi, I do use Thesis on one of my blogs, but I for one found it lacking. I didn’t like the way I had to learn ‘hooks’ to get it to do a lot of the stuff I wanted it to do. This meant it wasn’t as ‘out of the box’ friendly as it was touted to be. My only resource was to keep looking until I found one that was really user friendly and I’m so glad to say that I found the one I was looking for. I guess it depends on what you want to do, if you want to change the color, how many sidebars you want to have, favicon, logos, some of those light modification, then you do not need the hooks. That’s just the thing. I can do most of that and more without hooks. I can change the color of fonts, the fonts themselves, the color of the links, the comment box and all with the click of the mouse. Yeah those layout like color modifications are easily made in Thesis option in the dashboard. People said thesis is better 😉 but still theme is one of the factor of our blogging success but not only one. I wish someone give it to me for free, lol! Agree, theme alone won’t work, however optimized theme is important too, for example, thesis has no index attribute for “search”, tags etc, those are very important. I love Thesis as well, what i love the most is it gives you “nofollow” links where they should be. I am thinking about switching over to thesis since everyone talks about how great it is. The only issue I have is that I dont know if it will carry over all my posts to the new theme. Do you know? Will i lose any posts or information if i switch to thesis? Changing theme should not make you loose any informations for the post, unless your old theme has different code for thumbnails for example. Some things which may be gone (but easily fixed) is if you current theme has breadcrumbs built-in, related posts built-in, though i checked, your theme does not have those. Always backup your database first before doing some small thing is a good idea. Thesis is really great, i wish i did not modify this theme so i would switch to Thesis 🙁 But i use it in my other blog. Thank you for visiting, Chris! Yes, Thesis is the best SEO optimized theme ever! Even I got a better result in my blog after switching to Thesis! I have also switched my theme to Thesis a few days ago. I sure like the change, it is surely more clean. Thanks for the comment Pankaj! Thesis is the way to go! You’ve made a smart investment with Thesis. It’s so easy to use even a beginner like me can manage without any help. How did you highlight the author comment? I’ve always wanted to do that on my blog. I agree with you, that Thesis is user friendly if we want to modify not in a heavy way. Replace the #e7f8fb to your own color. A great theme, not only for SEO reasons. Great design, well organized and quite elegant. Will consider to use it on my next site. Actually i don’t so much agree with “great design”..Thesis is a framework, the design base is very clean and simple, but we can modify it ourselves, and it’s easy to do since it has tons of design features. Yes, this one i agree, that it is well organized, elegant, and the most important, its SEO optimized, by default it sets to some links to nofollow, which is very important. Good luck with your next coming sites. Thanks for commenting, Bruce. Thanks for the link to the Thesis theme now that I have made the change. Most welcome! love the new cleaness in your blog. I’ve always looked with envy at Thesis sites – only problem is the price. At the moment I use a theme by Elegant Themes but one day….. Yes, Thesis is a bit costly and Elegant theme is also a very nice theme i put it in my top premium wordpress theme list. I also bought Thesis from the money i earn from this blog.. I just switched my theme to Thesis right now and experiment whether my traffic will drop or not after switching my theme, will let you know.. Thanks for visiting Keith, have a great weekend! Yes I noticed your link to Elegant Themes. You must let us all have a few tips. ahaha LOL, yes, i do earn money with this blog, not alot but i could bought Thesis theme and wp robot3 from this blog.. I am not that typical person who tell people how much and how do i earn, but surely i will share with my readers one day .. I agree that thesis is awesome for seo. I actually wouldn’t use it for much other though as I’ve found that customizing code the real way always gives you better results thank just changing a setting on an interface which you cannot do as much. Amazing that it’s W3C validated. I almost agree with you, i love Thesis mostly because it gives me easy possibility where to put nofollow links, which are already set by default on the theme. The design, i prefer the clean one. 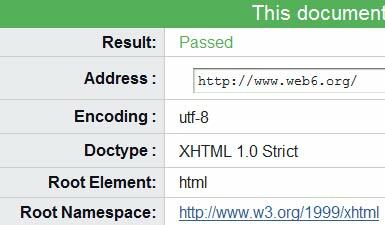 Yes, it is validated, though it is harder to validate cause it has XHTML strict, but it also means it is more accessible for users. I do not believe in using themes for wordpress. Well you can start out with a theme but you must customize it to make it your own. Distance yourself away from the competition. I do believe in using theme, i noticed it. The problem is i have heard people complaining their traffics drop after changing their themes. I did think 100x before i changed mine to Thesis. The result, my traffic is even almost doubled since i changed my theme. The time before i used Thesis, whenever people talk about it, i ignore it, i thought, “Oh i use my own free modified theme, and i am doing just fine”. Funny enough, after i use Thesis, i regret why i did not use it sooner. Many people have this situtation. Hope to see you around here. love ur blog. I would like to develop a website for one of client. He wants me to develop a website similar to foxtons.co.uk. Can you recommend any theme Which will be suitable for this website? or what do you about thesis theme? Do you think Thesis theme will be appropriate for developing foxtons type website? Any opinions will be appreciable. It does not matter what kind of niche of any website you want to build, the theme should be SEO optimized, otherwise, the website and its products are great, but none find it! Thesis is definitely recommended but you have to know lots of coding to modify Thesis to have a similar layout like foxton site, if not, hire someone, thesis has lots of independent designers to hire. I agree that thesis is awesome for seo. I agree! Thesis is very easy to modify about the color, how many sidebars you want to have, menu hover, drop down, etc, but to have a specific layout that is similar to a website, like another themes too, you need to know about coding. Other alternative is hiring someone. last year i use thesis themes, but i dont really like it because it more complicated for me..
and i choose frugal theme. this more better than thesis in my opinion..
Hmm..Thesis has support forum, and video tutorials if you have a problem, also it has huge compilation of tutorials, just be sure you have access there and ask. I love using thesis too… the features are cool to use. In my opinion, NO; you did not make a mistake. I did the same too, i used free theme. Once i can earn money from my blog, i start buying premium theme. WordPress has tons of good free themes that you can use, those premium themes gives you a plus, but i recommend use free themes if you don’t want to spend money for your blog from your own money.. I love thesis too, but the only problem is, when we want to change another theme, we can’t import thesis title, meta desc, keywords from every article. Yesterday I tried my new theme, i lost my position in Google.co.id 🙁 So I changed back to thesis. he he he..
and then i switched to Thesis. My traffic and ranks are well, even the traffic is increased. I guess it is one of the proof that Thesis is a SEO theme, if you switch from other theme to Thesis, it will be fine, but switch from Thesis to another theme, you will loose the traffic? Not sure if this makes sense, but since you and i have almost similar experience..
Yeah, what a plus is Thesis gives you nofollow links and SEO optimised links where it should be out of the box for SEO dummies like me LOL. Nice blog you have here. I agree that Thesis is a very great theme. I like its functionality and it is great even for new bloggers who don’t know much about CSS and other technical blogging knowhow. Thank you for visiting my site as well. Yes, i agree 200% with you, though at the first time, i did not even want to try Thesis, when i did it, i loved it. It’s a great theme in all aspects. SEO, Design, functionality and all other. Same here, i also plan and plan something and all not yet done..
Thesis is great try it if you have time and chance. I’m on the verge of buying Thesis – I only hear good things about it. I know that you get a lifetime of updates but do you get a lifetime membership to the support forum? If you buy personal option which is $87 from DIYthemes, then you have a lifetime update and lifetime membership on forum. But if you buy through me (as in my free service page stated) you get update from me, and no support forum access. I would say, for $87 in a lifetime, i would get personal option.. It has 30 days money back guarantee, so please remember this if one day you decide not to like it. I agree the word press theme. I have used the same theme for my blog. The blogs theme is a one of the main thing in SEO, so everyone use this theme and get more visitors. I vote for thesis though. I used flexsqueeze about a year and a half ago. You don’t get the customizability or the support that the Thesis Theme gives you. Always go with Thesis Theme. This is incredibly surprising.This is really resourceful article and interesting also.Thanks for sharing nice idea.I think it will be helpful for me. Thesis is a beautifully laid out theme. It’s very modern, simple, and has just the right balance of white space. What makes it really cool is that you can change the number of columns (1 column, 2 column, or 3 column layout) as well as their widths in the Design Options panel with just a few clicks (no programming necessary) – and each configuration still retains that professional look. Thanks for sharing your knowledge, one common factor that I have found on most top ranked blogs is a particular theme (No points for guessing!). However, it is difficult to say whether the ranking is because of the theme or just that Thesis happens to be the oldest theme and most bloggers started with Thesis. apart of Thesis is SEO optimized but it also loads fast, there are actually some people who test Thesis and another premium themes, measuring which one is faster. and Thesis tops them. I love Thesis Theme too. It has many SEO Features in it. Very detailed review. The recent updates do not seem very good in the favor of Thesis. Almost all top bloggers, have moved away from Thesis and moved to genesis. How does Thesis compare to Genesis? Please let me know. Thanks. I have used both of them, and to me Thesis is better, because when we want to modify appearance, in Thesis theme we have custom functions.php and custome style.css that can be easily modified if you know a bit of php or css coding. If not, the support forum is also helpful. With Genesis, I haven’t been in support forum, because I know it from my ex-client’s site. As far as I know, if you want to modify Genesis, you will have more complicated way, because it does not have custom files that we can edit, so we have to know more of coding language to modify layout, Genesis offer child themes, but also costs money. That was last year, I don’t know if Genesis has new features in the meanwhile. I am very new to wordpress and blogging. I have started one blog using Profits Theme. I was thinking about doing another blog using Thesis. I only have one problem with Profits Theme, and that is that the same sidebar widget offer appears on all pages and cant be changed. For example if one page on my blog is about diet i have sidebar ad for diet program. But on other page, if i have sports shoes, then i cant put different sidebar ad on that page so there is diet ad on sports shoe page if you understand what i mean. Is this normal for all wordpress themes. If i use thesis can i have different sidebar/affiliate ads on different pages. Welcome to my blog 🙂 and thank you so much for your nice words. I have a blogger friend who has profits theme, and the theme itself looks quite nice, I like it. About different ads on difference sidebars, as far as I know, you can achive it by every themes as long as you know coding. But if you already have profits theme, and you want to try to implement different ads for your specific post or page, there is a plugin called “widget logic” to display the ads. 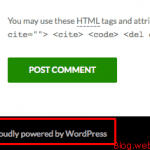 I personally never tried this plugin myself, but I recommend that you install wordpress offline first to try it, before you apply it in your real blog, if you want to use a plugin. If you want to purchase a theme, as far as I know, there is not any premium themes which can implement it with a single click of button, including Thesis. Thankyou very much for the advice Kimi. I will look into Widget logic for sure. Sounds like it might be what i need. Even if i have to pay freelance coder to get it to work properly it will be worth it. Maybe it might be nice for me to buy thesis theme to have in back pocket for further projects later on, if you know what i mean. The video tutorial on your blog makes it look very user friendly. thesis is best in terms of functionality, but when it comes to looks, its not so much preferred. And the skins are also so much costly. just started try this theme but dont know if works that good but certainly needs seo plugins l think. Really nice.. thesis is really the best SEO wp theme, I am also using thesis theme and it is working really great for me. But i will go with Elegant theme. started try this theme but dont know if works that good but certainly needs seo plugins l think. I like the Annotum Base better. It looks pleasant to the eyes. I was surfing the web to get me some help in enhancing the presentation of my blog. Luckily I came across your post, and it help me a lot. Thank you for introducing to me Thesis. Surely you can add the SEO plugins to any theme and get good SEO on any theme? Am I being super dumb? I thought that as long as you can edit the titles and meta your good to go whatever theme is employed? Yes, SEO plugin is important if your theme does not include “SEO” feature. Nowadays, there are themes which include SEO feature as “theme options”. Other than SEO plugin which can allow you adding title and meta, as far as I know, there are also other SEO factors like how fast your site loads, menu structure, etc.. In this case, a good coded theme can help loading speed. I hope this helps, but I do agree, only a theme won’t guarantee the first page of Google, but it can help. Hi Kimi i am using free Swift Theme and soon i will change my theme. Swift theme looks good too! In fact, I still prefer Thesis. Hey kimi i changed my theme to thesis from Swift hope you saw my new theme. I would like to hear your suggestion. And i need some suggestion about earning. I applied for Google Ads and its got rejected so anyother option to earn money from my blog? If yes than please reply me i would love to hear that. For some reasons I couldn’t visit your site, maybe server issue, it’s loading, but can’t load the site, will try it sometimes again. Apart of adsense, you can use affiliate programs like clickbank, or shareasales and others. I was first rejected but then accepted. Although not sure about the fact, lately bloggers from India and Pakistan have been delisted from adsense, although not all of them, but I am also not sure if this has something to do with this fact. Great post, Kimi! Yeah, Thesis FTW! nice theme. Can I download it for free? I’m using always a optimal theme. Always using the seo-plugin. It works well for me. Many thanks! good theme for my site, thanks for share the theme. I am very disappointed by my blogs seo and have been searching for a easy way out. Thanks for guiding me. yes , i admit THESIS FTW. Which theme will you suggest for low budget bloggers, (free theme preferred :D) ? Yup I totally agree. Thesis is indeed good for bloggers as it is SEO optimized and has a lot of layout flexibility. i like thesis themes..as it have many features of seo…just love themm…! !